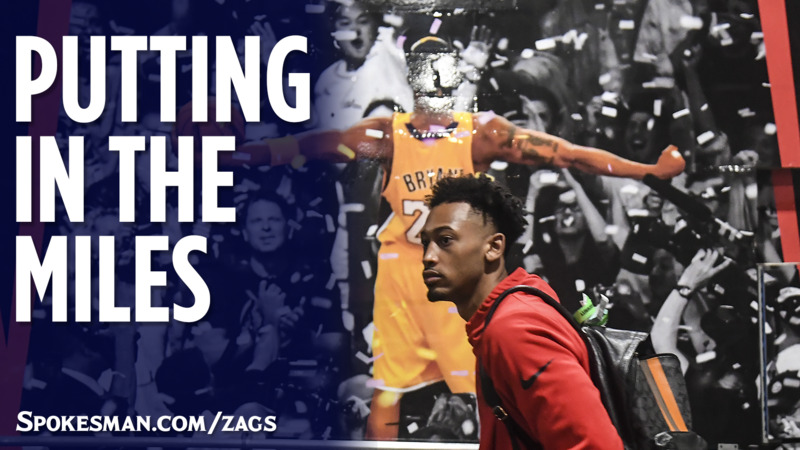 UPDATED: Tue., June 19, 2018, 6:34 p.m.
Johnathan Williams has been everywhere, man, he’s been everywhere. The former Gonzaga forward has toured the country the past few months auditioning for teams in advance of Thursday’s NBA Draft. And yes, that has taken Williams to several cities and states mentioned in the lyrics of the popular travel tune. Williams has embraced the journey, which includes being able to keep several workout shirts and/or No. 3 jerseys from NBA teams, while stockpiling mileage with three airlines. The 6-foot-9, 228-pounder believes he’s made inroads with NBA front offices, but most draft gurus don’t anticipate Williams among the 60 picks. Williams is listed 98th in nbascoutinglive.com’s Top 100 and 26th among a deep crop of forwards and centers. He was honorable mention on nbadraft.net’s list of top power forwards. “The things I did at Gonzaga showed through,” Williams said. “I’m an energy guy, finish around the basket, can switch on ball screens and use my feet on the perimeter. I’m showing more leadership skills and being active in all my workouts. The latter, Williams’ perimeter shooting and free-throw accuracy, are probably the biggest holes in his résumé, but his athleticism and versatility translate to the pro game. Gonzaga has had three lottery picks in the last five drafts – Zach Collins, Domantas Sabonis and Kelly Olynyk – but other Zags have made the NBA via alternative paths. David Stockton, who finished last season with Utah, played four seasons in the NBA G-League. Kyle Wiltjer was undrafted but made Houston’s roster in 2016. Williams discussed the draft process with Wiltjer and Nigel Williams-Goss, who was taken by Utah in the second round last year before playing his first pro season in Serbia. They gave Williams pointers on selecting an agent and excelling in workouts. Williams, a two-time All-West Coast Conference first-teamer and AP All-America honorable mention, is back in his hometown of Memphis, Tennessee, for the first time since December. When he wasn’t traveling for workouts, he was busy training in Cleveland. Williams hasn’t decided if he’ll watch the draft on television. He knows he doesn’t appear in mock drafts, but he’s confident he’ll end up in the same place as many of those who will hear their names called Thursday. “That (belief) goes back a long time,” he said. “With my work ethic, anything is possible. Published: June 19, 2018, 5:27 p.m. Updated: June 19, 2018, 6:34 p.m.